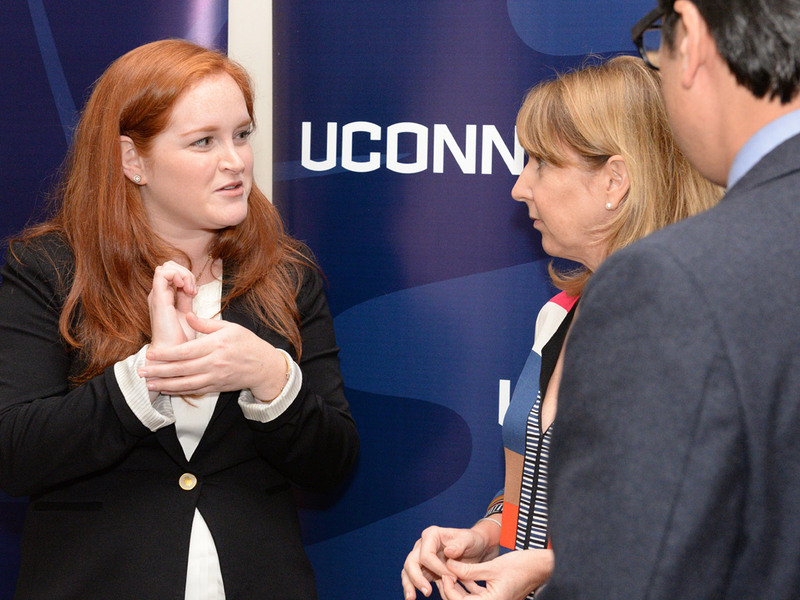 UConn fourth-year medical student Kaitlin Markoja talks with Donna McKay, executive director of Physicians for Human Rights (PHR), and Glenn Mitoma, director of UConn’s Thomas J. Dodd Research Center. PHR was honored on Nov. 2, 2017, with UConn’s 2017 Thomas J. Dodd Prize in International Justice and Human Rights for its longtime global efforts to prevent human rights violations. UConn School of Medicine students have launched the UConn Immigration Rights Initiative (UIRI) to aid individuals seeking asylum, providing medical and mental health evaluations to improve asylum seekers’ chances of being granted safe haven in the U.S. The asylum advocacy effort is led by UConn medical school’s student chapter of the internationally renowned organization Physicians for Human Rights (PHR), which recently joined forces with the school’s Physicians for Social Responsibility (PSR) student chapter. Currently, the PHR-PSR student chapter is co-led by second-year medical students Anastasia Barros and Martina Sinopoli. Together, the group of more than 30 medical and dental students is committed to addressing patient health through policy, advocacy, and community outreach. The UConn Health Asylum Clinic, located in UConn Health’s Outpatient Pavilion, builds on the success of UConn Law School’s student Asylum and Human Rights Clinic, founded in 2002. That clinic’s work has provided legal help to more than 120 people who fled political, religious, or other persecution. [Exposure to refugee health needs] offers students a window into the global health arena and an opportunity to gain unique skills … that are transferrable to the care of virtually any patient. The pro-bono forensic physical and psychiatric examinations provided at the clinic will help immigration attorneys prepare asylum affidavits, Sinopoli says. PHR’s national chapter was instrumental in helping the students establish the Asylum Clinic. PHR trained students participating in the UIRI to perform the forensic evaluations, looking for signs of physical or mental persecution that asylum seekers may have experienced. The national and regional PHR chapters plan to refer asylum seekers in Connecticut to UConn Health. Dr. Susan Levine is the medical director of the student-run UIRI and heads UConn Immigrant Health, an entity that includes an immigrant health clinic in general medicine, as well as a student and a resident curriculum in refugee health. This entry was posted in UConn Health News and tagged Asylum, Dr. Susan Levine, Immigration, Physicians for Human Rights, Physicians for Social Responsibility, UConn Health Asylum Clinic, UConn Immigration Health, UConn Immigration Rights Initiative, UConn School of Law, UConn School of Medicine. UConn Health has begun tracking cancer patients with an advanced heart imaging test before, during, and after chemotherapy and radiation therapy.